Many saw the old spinster hang herself that night. But not many saw what really happened. It was a cold and blustery evening, when we arrived at the bridge in the Old Winter’s Cemetery. Why was it called Old Winter’s Cemetery? Nobody knows. But that's what it was called. At least by the old people. Nobody had been buried there for a long time, the vegetation had grown over, covering the graves, save the odd headstone poking its head out from under the thick canopy. Even walking through the shrubbery was hard, though not impossible. 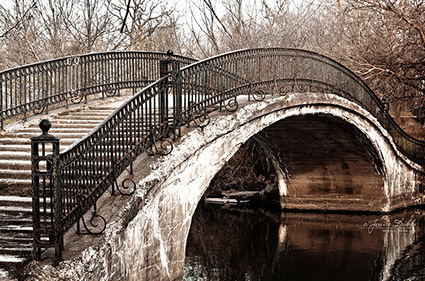 The bridge itself was broken, rickety and kids often took dares to cross over it. The group of us, teenagers took off from the eastern gate, already getting dark, we took it upon ourselves to go to the bridge in the dark, like some sort of foolish initiation. We heard the screams almost as soon as we set foot on the grounds. We ran. Or crawled. Or trudged through the bushes, and soon enough we stood at the top of the small canyon whose sides the bridge used to connect. We saw her hanging there. At first, while still making out way, we imagined various scenarios. She must have committed suicide. She was murdered. She had a fall. When we arrived, we still couldn't see it well, but she was hanging on the right pillar of the bridge, a few feet down from our level. She was still alive. Alien, gurgling sounds came from her throat. We couldn't see what was holding her up, but we felt the cold air and the dense atmosphere. We felt this was no ordinary happening that we were witnessing. That was when I saw the man standing next to me. The sounds of my friends quietened, and I heard him speak in a soft, friendly voice. I followed him onto the bridge. 'Look!' He pointed, and I noticed, for the first time ever, that the bridge had a gap in it. About four feet from the beginning, and in line with the first pillar, there was a gaping hole, where what looked like planks had been removed. I didn't even question at the time how I could see all this, it being by now pitch black. He walked over the gap, back and forth a few times, emphasising how it was not visible normally and nobody could see it. ‘They walk over it.’ He said. I didn't question him. As in a dream, it all seemed to make sense at the time. One of my friends suggested someone goes down to see if we could help her. I moved. I slid and burnt my hands as I descended down the side of the canyon rather faster than one really should. And there I stood, at the bottom of the bridge. The pillar was constructed of metal, with many cross bars, so it was never hard to climb. We had done this many times as kids. But this was the first time I saw that on this metal construction were numerous small metal bits that looked like razor blades. As I climbed, I tried to carefully avoid them. Up at the top, I saw a black moving collection of threads. Or maybe it was a veil? It looked a bit like the Dementors from Harry Potter. It seemed to have got snagged on one of the blades. This is when I knew. I knew from the man, even though he was no longer there and he did not speak. But I knew that the blades were there to cut someone free from their early ties, that when it was their time, the blades moved and sliced their sole free from their body. Why the old woman got snagged and couldn't go, was not clear to me. But I knew my job was not to try to save her life, but to free this tangle from the blades. I took my pocket knife and pried the black mass free. It jerked and then, with a swift move it flew away. I sank to my knees at the bottom of the bridge. There was a body lying next to me. Then I saw the blades starting to move again. They sliced into my knee as it rested against the pillar. I let them. I now heard my friends around me again. 'That was awesome' I heard, 'you couldn't have done anything' and 'at least you tried' were some other comments wafting towards me in the space. 'Oh but you hurt your knee'!’ came a worrying voice on the left. I did. My knee would never work the same after that. But I didn't mind. I saw why the bridge was there.